In today's competitive marketplace, job seekers must find ways to differentiate themselves. One way the College of Business at Indiana State University is preparing its students for that challenge is through initiatives focused on personal branding. Successful companies have long been those that leverage successful brands-unique, positive characteristics that people associate with products or services. In much the same way, successful business professionals are those that stand out because of their positive contributions, said Kim LaGrange, director of the Center for Student Professional Development. "The idea of a brand is that it provides an avenue for an individual to differentiate him or herself so that the world will be able easily identify some unique characteristics about that person. More and more we see personal branding becoming a popular concept for job seekers as they try to stand out in the employment marketplace as a means to portray their positive attributes to prospective employers," LaGrange said. The center is taking steps to ensure that students have a chance to put that concept into practice as they look toward their careers. "One of our most significant efforts has been the Executive Dining Experiences," LaGrange said. "The idea is to give students an opportunity to do some research about a topic relevant to business and then have informed conversations with business professionals about that topic over a formal dinner." The first event was held in the fall of 2008 at the Ohio Building in Terre Haute. 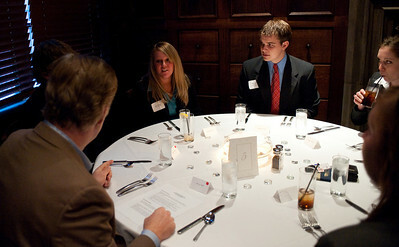 The second event in the series, held this spring at Dunaway's Restaurant in downtown Indianapolis, focused on the concept of personal branding. Bailee Souder, as senior public relations and marketing major from Garrett, said the Indianapolis event gave her a better understanding of how business professionals effectively implement branding. "The executives all had wonderful knowledge about the workforce and emphasized how important it is to set yourself apart from everyone else in order to get that desired position," she said. "The main objective that I learned is the need to know how I am going to distinguish myself from all of the other business professionals in the workforce. How is my brand unique from the other brands competing for the same position?" Denny Sponsel, president of RJE Knoll Business Interiors in Indianapolis, knows firsthand how the power of a positive brand can affect a company. "People want to be aligned with business and other leaders in enterprise who are consistently recognized as performers-caring, responsive salespeople. Those are the kind of qualities that resonate and help build a quality brand and reputation," Sponsel said. Sponsel added that personal branding comes down to a matter of reputation. "It is important to keep in mind that in personal branding you can also have a brand that is a negative brand: someone who is not caring and cannot be counted on. People often ask why they are unsuccessful or don't get chosen for high-level projects and the answer is often because they've created a negative brand for themselves." With more than 30 years in the furniture business and extensive involvement in the Indianapolis community and throughout the state, Sponsel has seen many young professionals benefit from a strong work ethic. He said programs like the Executive Dining Experience are key for aspiring professionals. "Indiana State has a great focus on experiential learning and I think, from a business perspective, that means positive interaction with role models who can share positive life experiences," Sponsel said. "Students need to know what to expect and the dining experiences are designed to provide that experience in a professional setting where students are free to ask questions on a variety of topics. They hear about the real world rather than reading about it in a book." Communicating one's personal brand is another key element to success, LaGrange said. The center will host a workshop in October focusing on the concept of personal branding and how students can leverage online resource to communicate their brand. "More and more individuals are developing personal Web sites, personal blogs, through which they can express themselves and articulate what is important to them," she said. "We even see some job seekers and other professionals adopting personal mission statements and incorporating those statements into their blog or Web site." Souder created a mission statement as part of a class project and said the statement has taken on a deeper meaning as she begins her job search. "After the Executive Dining Experience and the research that I conducted on the concept of personal branding, I found that a mission statement and personal ethics code are the essential elements of my personal brand," she said. "My mission is to ‘stay true to my own life and morals in whatever career I choose to pursue.'" This mission statement explains how I value morals and ethics in my life as well as my career. It provides a statement of how much I value my life and how I will carry myself in whatever career I am in." That kind of self-awareness and the ability to project a positive image to future employers will pay big dividends for Souder and other ISU students as they enter the workforce, Sponsel said. "I would hope that students realize that from day one they are creating a brand that will stick with them for a long, long time," he said. "There is nothing more powerful in your life than having others recognize you as a person of character." ISU's College of Business is helping to prepare students for a competitive marketplace through personal branding exercises.